I adore strong flavors, and always have. My mother tells me that when I was teething, I used to run about with a scallion hanging from my mouth, and I would gum it furiously, until green dribbles would stain my lips and chin. She said it looked ghastly and smelled worse, but it kept me from fretting and screetching over my aching gums. I am not surprised by her tale; to this day zweiback and arrowroot crackers give me the creeps. I remember giving them to my cousins when they teethed and being utterly repulsed by the gummy slime they turned into. I detest bland, boring twaddle foods–give me bold, untamed flavors that paint the tastebuds in swaths of tingling delight. Garlic is probably my favorite ingredient. I swear, I would put it in oatmeal if I thought it would be good. The heady scent of a fresh head of garlic can make me swoon, arousing a nearly unsatiable hunger that swirls from my belly in voluptous waves that make my senses sing, and my tongue dance. And then, there is ginger. Oh, ginger–she is sweet, and she is fiery. She is a wicked lady, full of secrets and delights. She kisses citrus and turns sour into sweet, then minces demurely along, holding hands with sugar and lending her fragrance to scones, cookies and cakes. And then she tosses her head and leaps into the wok, flinging herself into a wild tarantella that releases her sultry fury. Oh, they can try and hide their wiles, but I know their tricksy ways. A judicious hand can tame them with the quick work of a knife, and the sweetness that lays hidden in their hearts can be wheedled out by roasting, but they are unapologetic elemental children of fire. And I would have them no other way. White peppercorns are so unassuming in form, are they not? Pale, perfectly round, like tiny stones worn smooth on a riverbed. No water shaped them, however, and once crushed, their aroma is as clear and piercing as the call of a hawk swooping on its prey in a flame-blue sky. Fagara, otherwise known as Sichuan peppercorn, is a flowerbud of a prickly ash tree. Ice hides her wintery essence in the heart of fagara, and tickling pixy fingers follow her laughing floral breath when the wok exhales, and the ash tree blooms again. And one cook mad enough to marry them together into one dish. I cannot say. I don’t remember, really, except that I had just started using fagara and wanted to create a dish to feature it, a dish that was new and different, and special. I had some exceptionally tender beef, full of dark richness and yang energy that I knew could withstand the onslaught of Sichuan peppercorn. 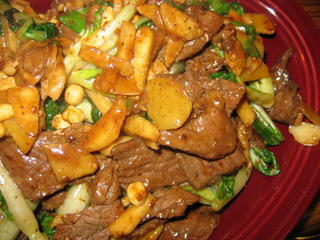 I also had fresh water chestnuts whose brittle, sugary quality and moonlike yin color would contrast perfectly with the beef. I wed the two together with a third component–baby bok choi–whose deep green leaves and pale stems played upon the velvet caress of the meat and the crisp snap of the water chestnuts. I sliced the garlic into narrow ivory chips, then plucked up a knob of ginger, and after peeling it with the edge of a teaspoon, sliced it into paper-thin ovals of gold. Four Thai chiles, green, yellow and red, were cut with flicks of my wrist into feathery, hollow wisps. I cast caution to the four winds and left their seeds intact. Finally, in the heavy green marble mortar and pestle, I ground the fagara and the white peppercorns, binding their scents into a prickly, floriferous duet of trilling soprano and whisky-smooth alto. It is to be a stir-fry, of course. All flash and fire, a dance of perfect timing choreographed by Bob Fosse to music by Tan Dun. The black iron wok begins the dance alone, partnered only by the fire in her belly. Her color changes slightly, going almost ashen and dull, before the sign appears: a thin wraith of smoke uncurls tendrils and the wok exhales, and I breathe the dark scent of her mysteries. Around and around her perimeter, the oil is poured, and it streams to her center, and lays like an oracle mirror, reflecting the present moment in perfect clarity. The oil shimmies like a belly-dancer’s veil, and it is time. My hand flicks, and a bowl is upended, and into the cavern of iron and oil falls ivory and gold, followed by the flutter of green, yellow and red feathers. They hiss and steam billows, and the shining wok shovel flashes like silvery lightning, pouncing, scooping, tossing and turning. Into the mortar my fingers blindly seek, and scoop and from the air, a snow of dark powder rains down, causing the oil to foam and sputter. Five fires twirl and spin in the wok, thier power blossoming as they are wed one to the other. The garlic kisses his old favorite, ginger, and she laughs and catches hold of the parrot-bright chiles and pulls them into the complex interlacing steps of the dance. The two peppercorns spin together as twins, then unfurl their scent as they fling themselves into the fray, then dissolve upon their brethren. 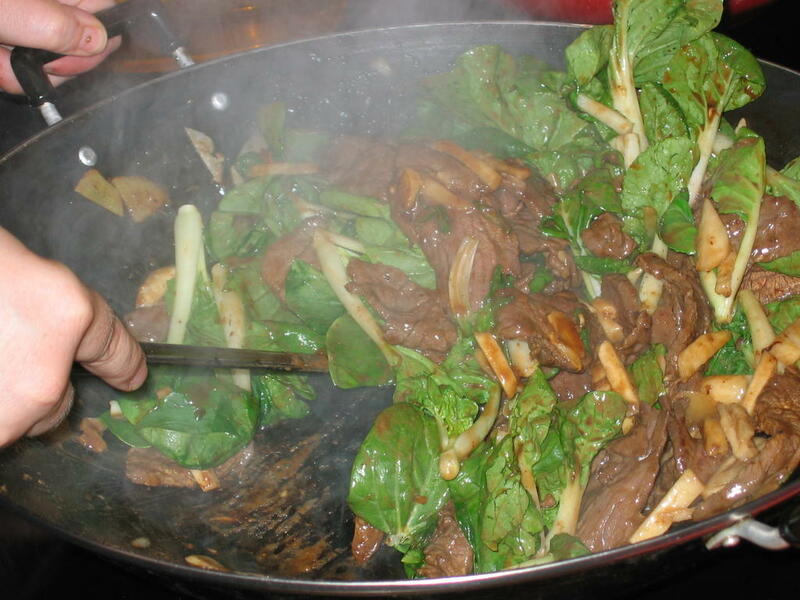 Into this cacophony, the beef, already bathed in sugar, wine and soy, is slipped, and I pat it down so that it covers the entire bottom of the wok, so that the dragon’s siblings can permeate its every fiber. I let it be still, until the scent of browned meat tugs my nostrils, then I turn it, and flip it and turn it again and again, watching the crimson flesh darken to the exact umber shade of the fructifying earth of my garden. When most of the crimson is gone, in go the water chestnuts, pale as slivers of moonbeam, crisp as bamboo leaves, and sweeter than a mother’s love. They do not stay still–I do not want them to burn or fall into lassitude in the heat, so they leap and whirl, until they are joined by an avalanche of green and silver like verdant rain from above. Scrape and turn and scrape; the rhythym of the wok is a steady heartbeat in the still air of the kitchen as steam wreathes my head. A flash of wine, a sprinkle of soy, and the leaves shrink upon themselves, the greens going soft and slippery as a secret, the white veins as crisp as newly fallen snow. All is coated with a sauce gone dark with mystery and dripping with mischief. 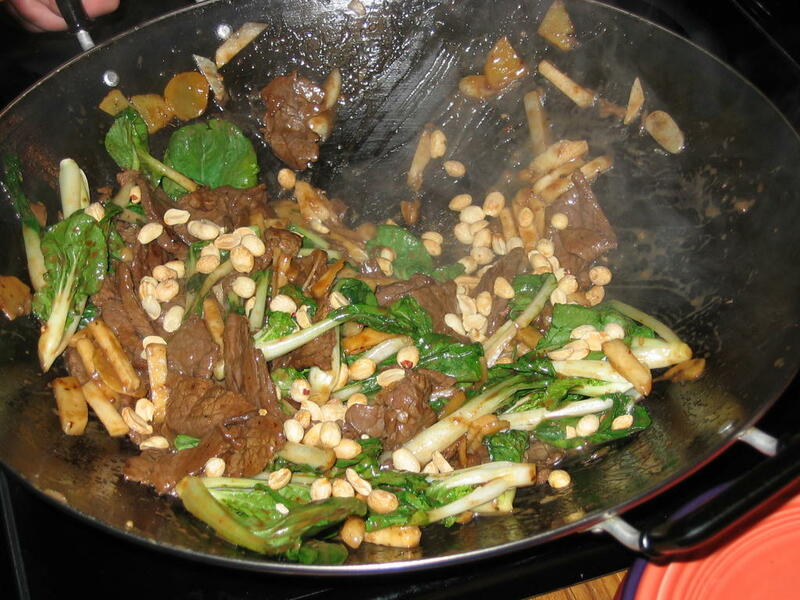 A hail of peanuts rings against the iron, and a drop of sesame oil giggles as it swirls into the sauce, melting into the darkness, hiding like a salamander among the emerald leaves. With a heave, the wok is raised, and the dancers move as one, as they are poured into the warm embrace of the platter. Chopsticks hover, waiting to pierce the writhing veil that cloaks the dish. 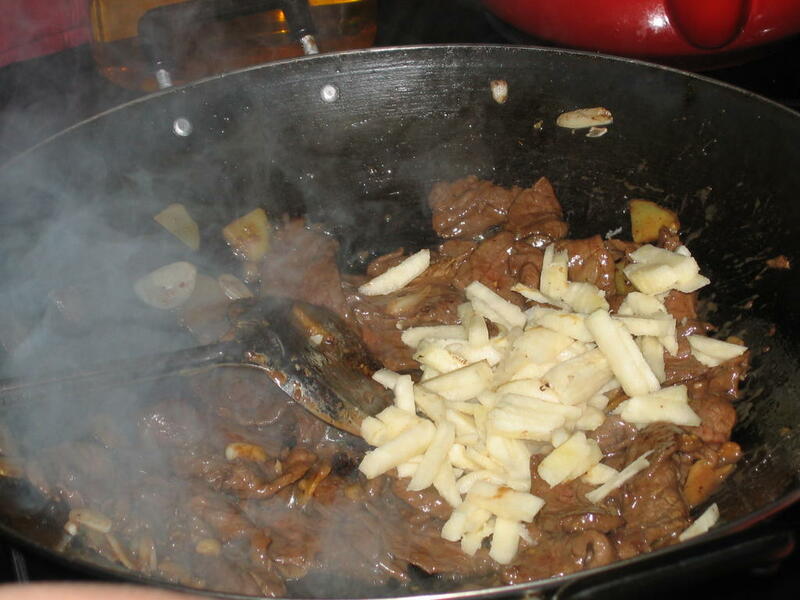 Toss beef with next five ingredients. Marinate while you prepare vegetables–at least twenty minutes. Heat wok until it smokes. 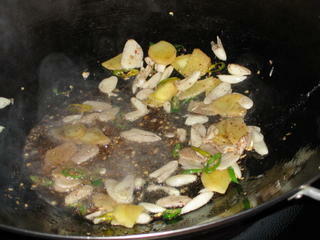 Add oil and when it shimmers, add garlic, ginger and chile, and stir fry for thirty seconds, until quite fragrant. Add Sichuan peppercorns and white pepper and continue stir frying for another thiry seconds. Add beef, and spread it out over the bottom of the wok in a single layer, pressing it down. Leave it alone for about forty-sixty seconds, allowing it to brown deeply on the bottom. Then, stir fry vigorously until nearly all of the red is gone. Add the water chestnuts and stir fry until all of the red is gone from the beef. Add bok choi and continue stir frying until greens begin to wilt. 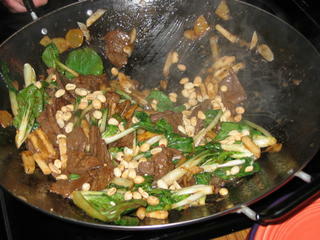 Add thin soy sauce and wine, stir, then add peanuts. Remove from heat and add sesame oil, stirring one last time before pouring onto a warmed platter. Serve immediately with steamed rice. 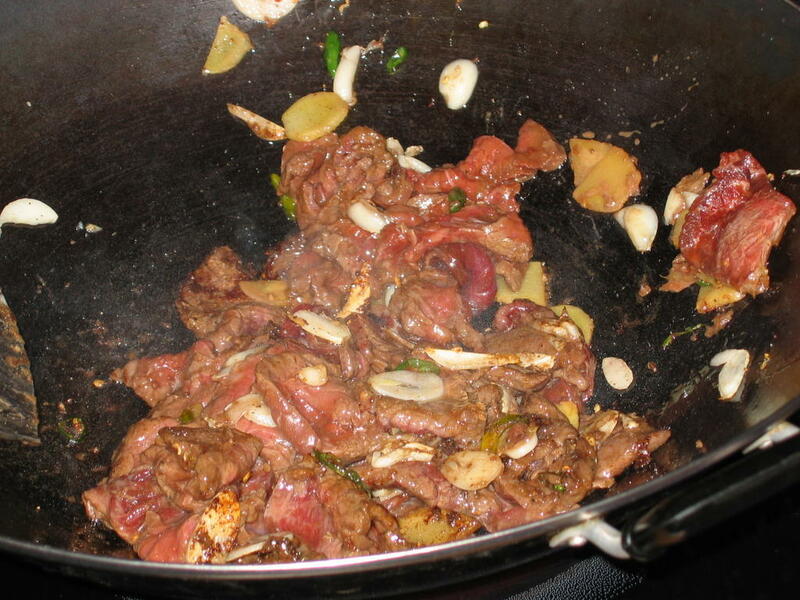 Barbara’s wicked version of Thai basil chicken used to be my favorite of her dishes, but when she first shared the pleasures of Five Fires Beef with me … well, let’s just say the reaction was not suitable for a family-friendly blog! Gosh Barbara, you can become a chef in a Chinese restaurant after seeing your wok action! Your comment about garlic and oatmeal reminds me of the book “Gossamer Axe”, when the main character puts chopped leeks in her porridge. For dinner Tuesday night, we had porkchops topped with fresh peaches. I took off their skins, roughy chopped them, and cooked them a bit with some water, a little sugar, a bunch of fresh minced ginger, a bunch of grainy mustard and 1/4 of a preserved lemon, chopped. Sweet and spicy and gingery and the chops were juicy and garlicky and . . . YUM! Eaten with a side of potato/squash salad (olive oil, appe cider vinegar, salt, pepper, fresh dill tossed with cubed boiled red skinned potatoes and steamed baby squash). “Garlic is probably my favorite ingredient. All hail the Stinking Rose! Something I have done: take steel cut oats, cook with chicken stock, add seasoned salt and of course garlic. It comes out more like “stuffing” than “breakfast porridge” but it rocks. I wouldn’t be surprised to find out that some enterprising plant breeder hasn’t come up with a “less hot” version of Thai chiles, which I find to be odious. If they are too hot for you, eat fewer, or don’t eat them at all! The truth is, though, that chiles vary greatly in their heat depending on the soil they are grown in, the amount of rainfall, the amount and type of fertilizer, etc. So, it may be that we have just gotten a hold of some dud batches of Thai chiles. On the other hand, some of the serranos I have bought at the farmer’s market are scortching, so they my find their way into the Five Fires Beef. Why, thank you, Boo! 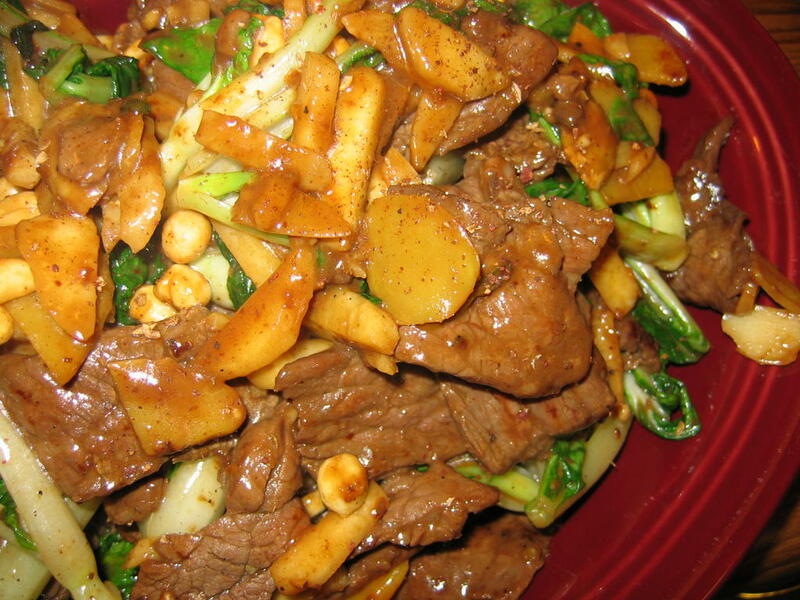 I worked as a waitress in a Chinese restaurant, long ago, but I really wanted to cook! At the time, I would never have been able to do it, but now–I could probably give it a shot. I have even cooked on a professional wok stove–one of those suckers with the gas flames that roar up several feet in the air if you move the wok. The ones with the volcanic heat–I used them in culinary school. Chef Lipa (half Spanish and half Chinese–all crazy–from the Philipenes) liked to watch me use one. The first time I was timid, but after he came over and told me I would be more likely to hurt myself if I did that, I got into it. By the last time I used it, I was using a Northern style Pao pan, one handed, flipping ingredients with my wrist and pouring in wine, then dipping the wok into the flame to light the contents and scortch off the alcohol. Before culinary school, I used to be terrified of fire and of getting burned. Now, I am a BTU junkie. What can I say? Hey, Amy and Selene Sue! I always figured that garlic or leeks would be fine with steel cut oats as a stuffing or some such. I just haven’t gotten around to making it. We usually eat the oats for breakfast with fried apples, dried cranberries, almonds and golden raisins. ‘The Gossamer Axe’ is a favorite of mine because there is a character named ‘Judith’ in Old Irish Gaelic and also that the protagonist opens the door to Tir-na-Og with rock-n-roll….isn’t it ‘Gonna Lay Solid Rock’ or is that ‘The War of the Oaks’? My last day off I made lemon/limeaid with a base of mint, lemon balm, and bee balm tea. I was standing in the garden with a colander full of leafy stuff topped off with Bee Balm in red, purple, and lavender and I thought of you and wished I had the technology to take and post a photo. I have made bread pudding with garlic cooked in a pumpkin as a side dish @ Thanksgiving…..
Five fires, and one wok to rule them all. Oh, Sichuan Peppercorns are now beginning to fill the market again. NY Times article: http://www.nytimes.com/2005/07/27/dining/27pepp.html? Hey, Judith–yeah, you are remembering Gossamer Axe. War for the Oaks is a different story, with Eddi and the Phooka. I adore bee balm/bergamot/monarda. In our old garden, we had it in light and dark purple, magenta, ruby red, crimson and burgundy colors. And–it spread like mad among the shasta daisies, which blooms at the same time, and they all looked awesome together. Hey, Dan–good to know you agree with Zak and I on the Five Fires Beef. It is pretty much one of my favorites, too. I also like the Winter Sunlight Chicken–the one made with Meyer lemons, but Five Fires is still better. Dear Barbara, I stumbled across your blog today, and have been reading for the past three hours. This is, without a doubt, the best food essay I have ever read. You are positively lyrical! It’s poetry. Ooh, and the recipe sounds so good that I am going to shop tomorrow for the ingredients and attempt it at home! Welcome, Lisa–thank you for your kind words! I did have fun writing this particular entry. Let me know how you like the recipe after you have made it. It is an intense experience….